With so many different printers on the market these days the average home user has become a little perplexed in regards to which printer to buy. Unfortunately the modern printers are becoming more cleverly designed to dupe the consumer into forking out their hard earned cash on hugely over inflated print consumables. I will endeavor to explain some interesting facts about printer ink cartridges which I hope will help those who are looking to purchase a printer to make a more informed decision ! An ink cartridge can be distinguished from a toner cartridge by it's physical size (usually much smaller) and also the fact that it is filled with ink rather than toner which is a powdery substance. The main manufacturers of ink cartridges include companies such as Brother, Canon, Epson and HP. All four of these manufacturers have been the leaders of printer cartridge development since the early days of inkjet printers when they were larger, slower and much more expensive. What many people don't realize is that the cheaper, generic brand cartridges are also often made in the very same factories that the more expensive genuine cartridges are made. This doesn't necessarily mean they are exactly the same quality however it means that they should, in theory be a quality product. Generic ink cartridges have for years been frowned upon however more recently people are realizing that they are of a much higher quality and well worth the investment. The basic ink cartridge consists of simply the plastic molding also known as the tank. Inside of the tank are generally 2 compartments. One contains the actual ink while the other houses the sponge. The sponge absorbs ink from the main tank via a small opening at the base between the two tanks. 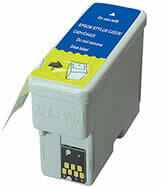 The sponge allows ink to flow through to the opening at the bottom of the printer ink cartridge. Brother inkjet cartridges and some of the older canon cartridges. Most of these style cartridges have now had a microchip attached to them so that the printer companies can manipulate the end user by changing software or even the printers firmware. Almost all cartridges utilize a breather tape also known as shipping tape. 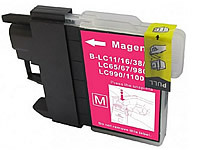 The idea of this tape which is usually located at the top of the cartridge is to vacuum seal the ink inside the cartridge until it is ready to be used. Just before installing the cartridge the breather tape must be removed to allow the ink to flow freely into the printhead. It is not uncommon for folks to forget to remove the tape when replacing cartridges and it soon prevents any ink from flowing and terminates the printing of that particular colour. The micro-chipped printer ink cartridges are the same as the basic Ink Cartridges, the difference being is that the ink level detection and/or cartridge recognition is done by using a small micro-chip mounted on the cartridge itself. This makes an electrical connection when inserted in the printer and tells the printer several pieces of information depending on the particular cartridge model. Some of the newer Canon cartridges use what is known as an "Opto-electrical chip" This provides a complex "opto technical signal transfer" between the ink tank and the actual printer. This enables the printer to detect ink levels and also whether the correct cartridge colour has been inserted as each cartridge colour has its own unique chip. Epson cartridges are also micro-chipped and operate in a similar way. Printer manufacturers often update the "Firmware" in their printers in an attempt to slow down the sale of compatible ink cartridges. Basically this means that when Epson bring out new printers even though they may use the same cartridges as a previous model they change the "Firmware" so that the printer will NOT detect a compatible cartridge. Usually however a compatible cartridge with a NEW updated Micro-chip hits the market within a few months and Epson are back working on plans to change the firmware again in their next printer model. So what is a Printer Cartridge Chip? Cartridge Chips have the ability to provide authentication to allow accurate communication.This ensures the machine and cartridge communicate the needs of the printer and uses the correct encryption and answers within a specific time frame. 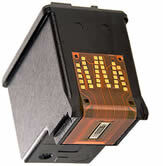 Most cartridges have the capability to hold data as they need to allow the machine to manage toner use. This determines the toner level and writes this information to the chip directly. The chip then sends this information back to the machine as requested. Cartridges will store ongoing machine information as the cartridge is used. The machine will count the pages printed, the pixels printed (page coverage), storing all this vital information on the chip to be recalled when requested by the machine. 1. A chipped cartridge does NOT control the yield. Chips are pre-programmed with the start yield, but the machine determines the page count, page coverage, toner low and toner out. The machine does write this info to the chip so when requested, the chip will report it back, but the initial determination comes from the printer. Once "toner low" or "toner out" is written to the chip, it becomes irreversible. This is why if you have a bad electrical contact to a magnetic roller and get a toner low error; even after you fix the contact issue the cartridge chip will still report a toner low condition. Once these errors have been written to the chip, the only way to clear it is to replace the chip. 2. A Chipped cartridge does not shut a machine down at a certain page count. Chips do not have this ability. Machines will use the information stored on the chip to determine if or when it should stop printing, but that information initially comes from the machine, and is not calculated by the chip. 3. A Chipped cartridge does not control toner level information. This is also something that chips do not have the ability to do. The machine determines the toner level by counting the number of pixels. The machine uses a formula to calculate the amount of toner used per pixel and stores that data on the chip. Some machines also have mechanical, electrical or optical methods of determining the toner level. Again, this info is stored on the chip, but is not determined by the chip. For a chip to determine the toner level, pages printed, etc., it would need to be incredibly complex and would take up much more space than would be economically feasible. Why duplicate expensive circuitry over and over when you can do it once in the machine itself? 4. A Chipped cartridge cannot give an error message. The machine contains all the circuitry needed to generate error codes. If the machine cannot see or read a chip, it will generate an error code, but it always comes from the machine, not the chip. The most complex type of printer ink cartridge of all are the ones with built in printheads. These are typically HP, DELL and some Canon. The printhead is the part of the printer which "spits" the ink onto the paper. These cartridges contain complex circuitry which detect ink levels, compatibility and have a myriad of small resistors inside which heat up and spit the ink out of hundreds of tiny holes onto the paper. These are also the most expensive of all cartridges to buy and most often the generic replacements are not very reliable. If you are considering buying a printer try to avoid these as most printers have the printhead built into the printer itself! Why on earth would anyone buy a printer that uses this technology. Its kind of like replacing your engine in your car whenever you decide to do an oil change. Avoid any printer which uses only two ink cartridges. All of these printers use cartridges with the built in printheads and they are very expensive to run. 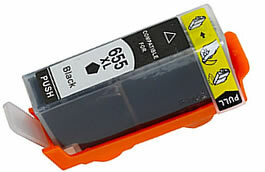 A Generic Ink Cartridge is simply a replica or a copy of a brand	name cartridge. Nowadays the non genuine inks are more popular than the actual	genuine product. This has been fiercely driven by the consumer	not wanting to pay the ridiculous prices of the brand name products. On	average a generic ink will sell for between 50 - 150% less than	the genuine. Often the non genuine inks actually contain a load	more ink which makes them a much more viable option. Be warned as there is a huge variation in the quality of compatible inks. Recently the market has been flooded with cheap, low grade	consumables so PLEASE do your homework and look at review sites	etc before parting with your money. Cheap, poor quality inks	will soon clog your printers print head or if poorly molded	may even completely destroy your printer. The main problem with very low grade generic ink cartridges is that the ink is not correctly formulated so it dries too quickly on the surface of the printer nozzles. These tiny nozzles are much finer in size than a human hair so you can understand why they can block easily if the ink is of a low quality. The better quality ink cartridges contain chemical "Inhibitors" which prevent the excess ink from drying rapidly on the surface of the printer nozzles thus preventing print issues. A tell tale sign of nozzle clogging is white horizontal lines across the printed page or in extreme cases complete colour changes such as blue becoming yellow and red becoming orange etc. Often when a printer becomes clogged the printhead clean utility on the actual printer is not enough to fix the problem. Often the bottom side of the printhead needs to be physically cleaned using paper toweling and a powerful cleaning fluid. Inkjet Ink Cartridges - this is a great site which helps answer many of the basic Inkjet Cartridges questions. Epson we have a problem- Anger over the new Epson 'Intelligent' micro-chip. Why Do Ink Cartridges Cost so much ? - an insight into the way the major printer manufacturers operate.